Morris Jones, a Constitutional Advisor of Mountbatten further stated: “The void which would be created due to absence of relations with princely states would have to be filled either by a federal relationship or by ‘particular political arrangements’ (International Affairs, Legacy of Mountbatten, 1983, p.624).” In his memoirs, he ascertains that the most favoured treatment for the princely state of Jammu & Kashmir was the referendum received by the Frontier States. Unfortunately, his consultative advice didn’t get any compelling recognition because it was put forward in the political turbulence of Kashmir’s October Revolution, and at a time when his viceroy status was getting retired. The status of Jammu & Kashmir was increasingly debated in the circles of Indian National Congress and was continuously hijacked by Nehru’s increasing pertinence to keep it with the Dominion of India - Nehru and his close associates wanted to see a failure in Jinnah’s two nation theory. He was a non-conformist spectator for his Hindu-Muslim unity at the Lahore Resolution, 1940, and uncanny to his Pakistan that was thoroughly secular, dwelled by a Muslim majority. 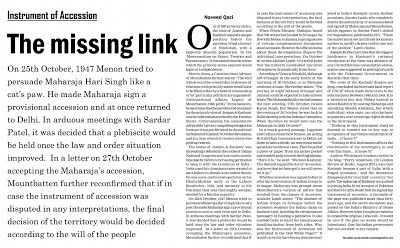 On 25th October, 1947 Menon tried to persuade Maharaja Hari Singh like a cat’s paw. He made Maharaja sign a provisional accession and at once returned to Delhi. In arduous meetings with Sardar Patel, it was decided that a plebiscite would be held once the law and order situation improved. In a letter on 27th October accepting the Maharaja’s accession, Mountbatten further reconfirmed that if in case the instrument of accession was disputed in any interpretations, the final decision of the territory would be decided according to the will of the people. Whether accession was signed before or after the intervention of Indian troops in Srinagar, Maharaja was prompt about Mountbatten’s version of advices that resulted from the clauses of accession. Alaister Lamb states: “The presence of Indian troops in Srinagar before the accession weakens the Indian claim on Kashmir’s soil, including the circumstances necessary in holding a plebiscite. It also enabled India to reject the simultaneous demilitarisation from both sides. 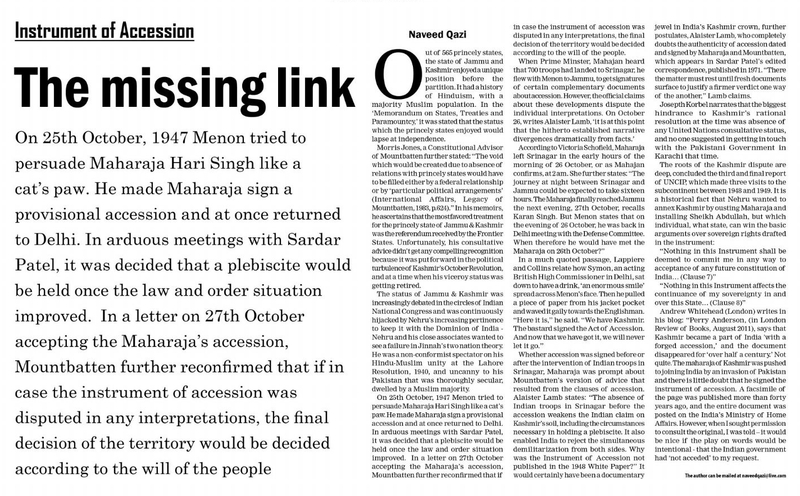 Why was the Instrument of Accession not published in the 1948 White Paper?” It would certainly have been a documentary jewel in India’s Kashmiri crown, further postulates, Alaister Lamb, who completely doubts the authenticity of accession dated and signed by Maharaja and Mountbatten, which appears in Sardar Patel’s edited correspondence, published in 1971. “There the matter must rest until fresh documents surface to justify a firmer verdict one way of the another," Lamb claims. Joseph Korbel narrates that the biggest hindrance to Kashmir’s rational resolution at the time was absence of any United Nations consultative status, and no one suggested in getting in touch with the Pakistani Government in Karachi. Andrew Whitehead (London) writes in his blog: “Perry Anderson says that Kashmir became a part of India with a forged accession,’ and the document disappeared for ‘over half a century.’ Not quite. The maharaja of Kashmir was pushed to joining India by an invasion of Pakistan and there is little doubt that he signed the instrument of accession. A facsimile of the page was published more than forty years ago, and the entire document was posted on the India’s Ministry of Home Affairs. However, when I sought permission to consult the original, I was told – it would be nice if the play on words would be intentional - that the Indian government had ‘not acceded’ to my request.